44 • March 2018 • S I G N & D I G I T A L G R A P H I C S DIGITAL PRINTING AND FINISHING DIGITAL GRAPHICS Alphagraphics, a shop in Roseville, California, recently installed this Mimaki JFX200-2513, a 4' x 8' UV-curing flatbed printer flatbed offering durable prints for both indoor and outdoor use. 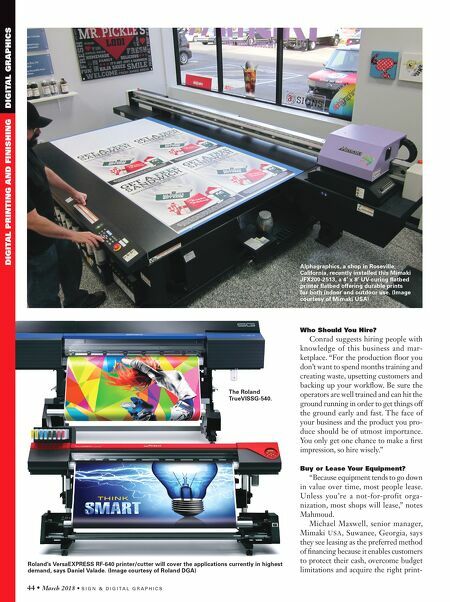 (Image courtesy of Mimaki USA) Who Should You Hire? Conrad suggests hiring people with knowledge of this business and mar- ketplace. "For the production floor you don't want to spend months training and creating waste, upsetting customers and backing up your workflow. Be sure the operators are well trained and can hit the ground running in order to get things off the ground early and fast. The face of your business and the product you pro- duce should be of utmost importance. You only get one chance to make a first impression, so hire wisely." Buy or Lease Your Equipment? "Because equipment tends to go down in value over time, most people lease. Unless you're a not-for-profit orga- nization, most shops will lease," notes Mahmoud. 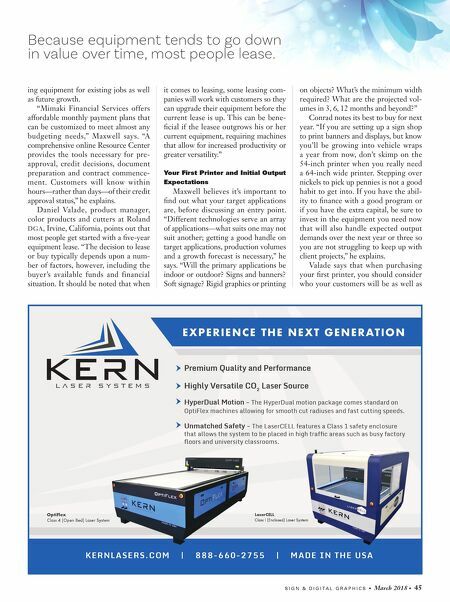 Michael Maxwell, senior manager, Mimaki USA, Suwanee, Georgia, says they see leasing as the preferred method of financing because it enables customers to protect their cash, overcome budget limitations and acquire the right print- Roland's VersaEXPRESS RF-640 printer/cutter will cover the applications currently in highest demand, says Daniel Valade. (Image courtesy of Roland DGA) The Roland TrueVISSG-540.